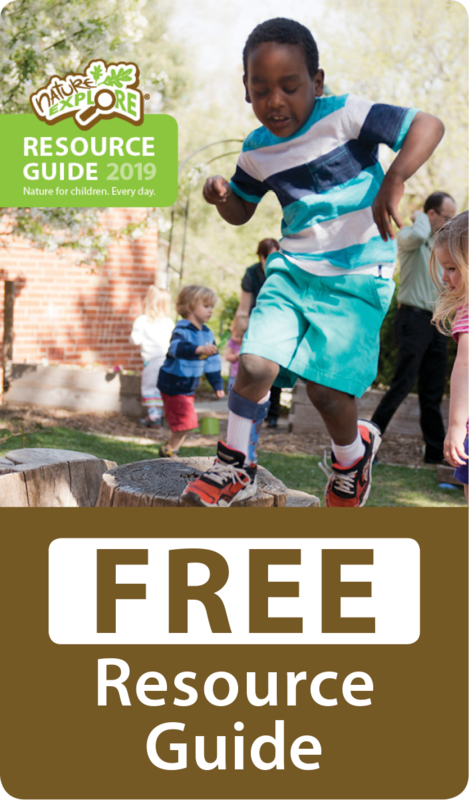 Created through a partnership of the Iowa City Parks and Recreation Department, ECO Iowa City, Backyard Abundance and Rockwell Collins, the Children’s Discovery Garden is a special space located on the north side of the Robert A. Lee Community Recreation Center in Iowa City. 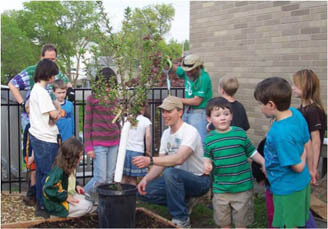 The long, narrow space used for the Nature Explore Classroom provided some design challenges which were met successfully. With all ten recommended area included in the design, and a dirt-digging area, children’s activities do not interfere with each other or cause disruption or frustration. The entire space reflects the needs of the children who use the outdoor classroom. Because of the small size, it was kept simple and orderly to create a welcoming space for children and their families. Local artisans and staff helped in the design and creation of the willow arch and nature art trellis. 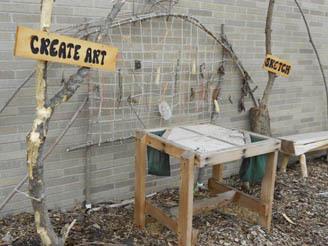 This trellis is located behind the nature art table and enables children to hang nature materials for display and inspiration. The music and movement area features an akambira with space for movement. Additional musical instruments can be checked out from the Recreation Center. 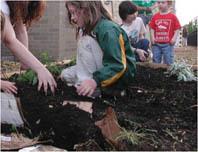 The Children’s Discovery Garden is filled with natural materials and living plants. 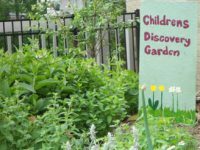 The sensory garden overflows with interesting and delightful plants such as mints, lamb’s ear, lemon balm and may others. The vegetable garden has a wide variety of plants from sunflowers to herbs, carrots, beans, and greens. Other perennial food plants include plants such as cherry and mulberry trees, strawberries and currants. Additional ground covers are being incorporated into the space to reduce the need for watering and weeding and to add beauty. The city recycling coordinator has donated a compost bin for easy disposal of plant material. A selection of high quality items were purchased for the outdoor classroom. Elements are durable and require little maintenance. Benches, stump stools, activity furniture, tables, balance beam and many loose parts are all made of wood. The abundant plantings and use of natural materials lets nature’s beauty shine through.